Listen to the Whisper: Music written by Geoff Boyce, sung by Tim and Alison Solly, with images from Colebrook memorial (Adelaide, SA) – can be used for Acknowledgement of Land. that all people might live in dignity. Amen. I don’t loathe myself but I do loathe that we’d so determinedly choose to celebrate on a day that Australia’s First Peoples collectively mourn. I loathe that people who remind us that sovereignty was never ceded and that great injustice continues today are called “indulgent” but those who refuse to listen with empathy to First Peoples’ voices are called patriots. at the heart of Australia. it has its place on our maps. the desert of longings that engulf us. the moon shining on the sand. may be heard most profoundly. Thoughtful article by Stan Grant, Identity politics traps the indigenous mind in cycle of grievance, published in April 2018 in The Australian. UCA President Stuart McMillan’s message for ‘Survival Day’ 2016. Aboriginal responses to Captain Cook – hard hitting video! Aboriginal People Respond to "Captain Cook". Today we stand in footsteps millennia old. May we acknowledge the traditional owners whose culture and customs have nurtured and continue to nurture this land since men and women awoke from the great dream. We honour the presence of these ancestors who reside in the imagination of this land and whose irrepressible spirituality flows through all creation. Jonathan Hill. This youtube clip has gone viral as an unofficial ‘national anthem’ for Australia to the tune ‘hey ya’. Rev Ken Sumner, an indigenous leader in the Uniting Church, reflects on Australia Day in this article. Notable speeches by Indigenous Australians here. of races and cultures in this country. Loving God, undiminished by distance, unconstrained by place or time, forever seeking, forever calling, forever drawing humanity to yourself and to each other, we glimpse your Spirit in the brooding silence of awesome landscape, the ancient law of Aboriginal nations, the unspoken trust of honest mateship. Yet in the vastness of this place, Australia, we often feel alone, alienated, unworthy of more than a passing acquaintance with your love. Help us understand you ever yearn to make us whole, drawing near in Christ to show us the way. Amen. => could be shaped as a prayer of confession, with silence after ‘with your love’, and the last line as words of assurance. and formed from its dust a rolling brown land. and created a rich diversity of life. an affinity with their lands and waters. and brought them to a place of freedom and plenty. and in the ethnic diversity of the Australian people. you have set your church. and equality for all people in our own country. so that we may be mutually enriched by our differences. and as constant as the grace of our Lord, Jesus Christ. Amen. The French historian Ernest Renan (1823-1892) described forgetfulness as “essential in the creation of a nation”. Renan is known for the statements that a nation is “a daily referendum”, and that nations are based as much on what the people jointly forget, as what they remember). Renan states: “Forgetfulness, and I would even say historical error, are essential in the creation of a nation.” Historical research, by revealing unwanted truths, can even endanger nationhood. nationality is based on sentiment. “All nations, even the most benevolent in later practice, are founded on acts of violence, which are then forgotten”. “Unity is always achieved by brutality”. He believed that people unite in their memories of suffering because alleviating grief requires a “common effort” which serves as a foundation for unity. Members of a community feel as though they have accomplished something great when they are able to survive in adverse conditions. “Now, the essence of a nation is that the people have many things in common, but have also forgotten much together”. Renan concludes that a nation is “a soul, a spiritual principle. Two things, which are really one, constitute this soul and spiritual principle. One is in the past, the other, the present. One is the possession in common of a rich trove of memories; the other is actual consent, the desire to live together, the will to continue to value the undivided, shared heritage….To have had glorious moments in common in the past, a common will in the present, to have done great things together and to wish to do more, those are the essential conditions for a people. We love the nation in proportion to the sacrifices to which we consented, the harms that we suffered”. (Ernest Renan, “Qu’est-ce qu’une nation?“, conference faite en Sorbonne, le 11 Mars 1882). and mountains breathe their stillness. and even the stones rap out their praise. Our creator surrounds and upholds us. Christ Jesus walks beside and upholds us. The Spirit moves within and between us. Blessed be God, our wonder and our delight. call to us, Spirit of God. and rising free in the humming of our cities. Call to us again, Spirit of God. Make your music of peace and joy in the midst of our life. and in your Holy Spirit lies our hope. Amen. This prayer by Dorothy McRae-McMahon could precede an acknowledgement of land. Sometimes we think we are small gods, God of all creation. and can tame its eternal energies. But it teaches us who we are in the cosmos, O God. invited to cherish a mysterious landscape of your making……. …….We acknowledge that we are on the land of the (name of traditional custodians of the land eg Kaurna) people and that the Spirit was in the land revealing God to them through law, custom and ceremony. The same love and grace that was finally and fully revealed in Jesus Christ sustained the Kaurna people and gave them particular insights into God’s ways. Therefore, we honour the wisdom of the Kaurna Elders and their continuing culture, and pray that we might all work together for reconciliation and justice in this nation. a landscape for life that is open and free. God’s Spirit the surfboard that dares us to-ride. to make new connections, to pray as we go. Music can be downloaded here. Here’s a write up about the 2014 action outside the Perth Immigration Detention Centre. Top 40 ‘Survival Day’ playlist on SBS website. The cry of pastoral stations, struggling for survival, sustaining meaning, nurturing achievements in the face of change, uncertainty and government indifference, seeking direction, shaping the future. God of grace, God of life, hear our prayer. In the name of Jesus Christ. Amen. => could have additional sections written for the current situations in Australia. “Praise to Christ” by Christopher Willcock & Tony Kelly, which was composed for the “Pilgrimage to the Heart” in 2000. Listen here. Can be purchased here. Or choose a powerpoint with Australian images such as this by Scott Leggo. TiS 672 expresses Australians’ thanksgiving for our land, sadness at the hurts of our history and prayer for our future. (The writer chose the tune Westminster Abbey). It was sung at the opening of the new Parliament House. The tune Bennelong can also be used – it is written by an Australian. Although not Australian, TiS 281 When God Almighty came to be one of us can be sung to Waltzing Matilda – I read in the introduction to the first Australian Hymnbook that that was the tune intended for it and then the writer realised we were having a national anthem debate so thought it was better to have a different tune – it is a bit of fun to sing and the words are ok. If you use the Advance Australia Fair tune, you need to repeat the final 2 lines of each verse. Written for Trinity Sunday but can be used anytime. who gather at your call. And for your ones in need. TiS 681. Lord let me see. Ross Langmead. TiS 687. God gives us a future. Elizabeth Smith. TiS 420. Holy Spirit go before us. Elizabeth Smith. Others that could be of interest….. In times of anxiety people often worry at questions of identity. individuals worry about sexual identity, Christians about church identity, football supporters about club identity, and citizens about national identity. Now in a time of anxiety about terror and cultural cohesion, we naturally fret about Australian identity. Identity is often imagined through the image of territory. It has boundaries that separate people from others. It includes distinctive practices, histories and beliefs that distinguish people from others. If we see identity in this way we might think it reasonable that people wanting to become Australian should know what cricket is and who Don Bradman is. From this perspective, when people take on one identity they leave behind their former identities. Chinese immigrants stop being Chinese on becoming Australian citizens; Protestants stop being Protestant when they are received into the Catholic Church. Dual identities become problematic – can you really be Australian and Irish, or an Australian and a Muslim? In his recent Quarterly Essay, Noel Pearson draws on a different image of identity. He describes identity as layered. We are human beings. We have a national identity, a regional and local identity, a religious or philosophical identity, a cultural and linguistic identity, a professional identity, identities associated with sporting clubs, recreational activity and social commitments. If we are asked what we are, we can answer that we are simultaneously human, Australian, Indigenous Australian of the Kulin nation, teacher, Collingwood supporter, Methodist, member of Rotary, and so on. All these things together shape our identity. The image of layers suggests rightly that we should not understand ourselves as self-contained individuals given a homogenous identity by membership of a group. We are persons in rich and complex relationships, all of which shape our identity. Each layer of relationships formed through affinity, culture, language and other factors will be expressed in distinctive beliefs, practices and interpretations of history. So, for example, Australians of Indigenous, English and Vietnamese descent will have different ways of telling the Australian story. This approach to identity may seem centrifugal and fragmented. But in fact it is cohesive precisely because it is multilayered. At each layer of our identity we connect with people with whom we may share little in common in other respects. We may be devout Baptists, but in our bowling club we mix convivially with Catholics, atheists, Christian Scientists and so on. We may Indigenous with a history of being discriminated, but in the local fire brigade we work cooperatively with descendants of the settlers who despoiled us. Australian identity is constituted by a complex network of interrelationships between people. The strength and variety of the layers of our personal and group identity contribute to a strong national identity. We shall be more cohesive as a nation if our citizens are passionately Indigenous, committed Muslims or Christians, active in our communities and social groups, strong in our convictions. But the strength of a national identity also depends on the strength and depth of the connections we make through these layers with people and groups different from own. If we are isolated in homogeneous and non-interactive groups, any larger national identity we have will be brittle. So it is important for national economic and social policy to enable inclusion. Australian identity is constituted formally by living together in same territory, accepting the claim that the institutions of governance and law make on us, and accepting other Australians as a ‘we’ and not as a ‘they’. The strength of national identity will depend on the richness and variety of the layers of personal identity within Australia and the richness of the interactions between people who are different. Because this is so, Australian identity is always changing: it reflects the changing relationships between people and groups within society. Our identity as Australians does not trump all other forms of identity. The best political drama has always focused on adjudicating conflicting claims of religious faith and of national identity, on deciding what belongs to God and what belongs to Caesar. In such disputes people usually appeal to the wider identity and consequent responsibilities that all human beings share by virtue of being human. When national laws and practices are inhumane, it is right to be ashamed of belonging to the nation and, if push comes to shove, to disobey the national laws in the name of humanity. That is why Antigone, Christian martyrs and conscientious objectors have been derided in their time and subsequently honoured, not only as individuals but as ornaments to their nations. They helped shape national identity. May the road stretch endlessly before us. May blue skies and the sun smile upon us. May gentle rain refresh us. May we find rest in the shade of gum trees. May you know the presence of God as you journey. And may the Spirit lift up your life. Amen. This entry was posted in Australia Day and tagged Australia Day, prayer resources. Bookmark the permalink. Many thanks for the great resources. 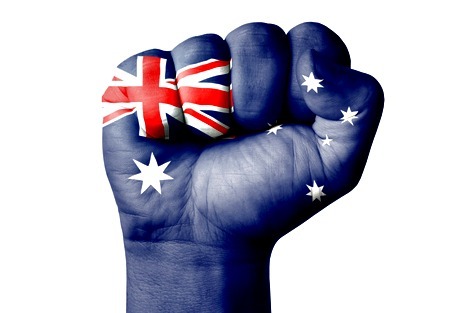 I am putting together a service for Australia Day this Sunday, and it is so difficult to find relevant, contemporary prayers, litanies etc, especially gathered together in one place. I am especially grateful for the hymn/song suggestions and the terrific words to well known tunes. I appreciate your hard work gathering all this together! Thanks, Marilyn. Glad the collection of resources is helpful to you. I stumbled across your blog a few minutes ago when (somewhat belatedly) i sat down to think of a reflection for tonight’s quiet service at St Peter’s Cathedral (after a long day of noise and cycles whizzing past in the TDU). I shall be reading one or two of the entries. Bless you. Great resource. We sang at the Australia Day ceremony this morning and now I am preparing for worship on Sunday. Thank you for the resources that have given me some ideas for leading in prayer for Australia – and maybe some songs. Thanks, Glenys! Glad the resources are helpful.